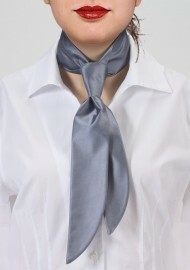 Looking for neckwear that is especially made for women? Below is our selection of women's ties. 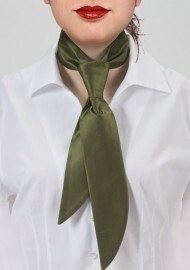 All colors are also available as matching men's ties as well as women's scarves. Click on your favorite color tie below. What is a Women's Tie? 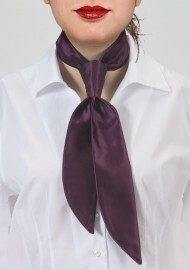 Our women's ties featured above are especially designed for the female body. The tie is actually more of a neckerchief that is not tied like a traditional necktie, but held in place with an adjustable band matching the fabric of the tie. Our women's ties are easy to wear, comfortable, and an exact match to our solid color ties. Who Wears Our Women's Ties? We regularly receive requests to help design and produce a company's uniform neckwear. Common industries looking for matching male and female neckwear are airlines, cruise ships, restaurants & hotels, catering services, security companies, and so on. Finding Ties that Match Our Women's Ties? 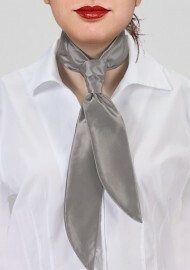 All women's ties featured above are also available as a matching men's tie. Please click on your favorite color above to see all other available color matching products such as men's neckties, pocket squares, and women's scarves. Ties or Scarves for Women? The choice is yours! 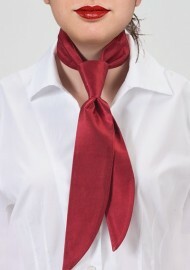 We at Ties-Necktie.com carry all women's ties also as a traditional women's scarf that is 22 x 22 inches in size. In addition, we can also create custom sizes, match your corporate colors, and even produce your own custom design.